Thanksgiving is right around the corner! I don’t know about you but I stress when it comes time to cook for a large group of people. Will there be enough food? Will it be warm? Will it be done in time? That’s why my Thanksgiving menu always has a few easy dishes that will allow you to stop wasting time worrying, and spend that time with your loved ones. 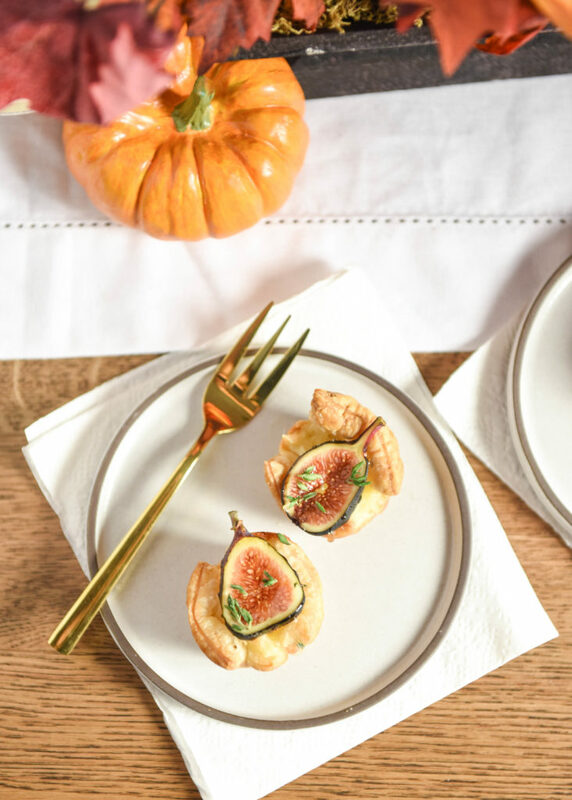 Today, I want to show you my easy Fig & Brie Tartlets – a quick appetizer that’s sure to wow and impress your guests. These tartlets bring together sweet and savory, soft and crunchy, in a flavor burst that is sure to make your guests feel special. No need to tell anyone they take less than 15 minutes to make! My favorite thing about fall produce is figs. 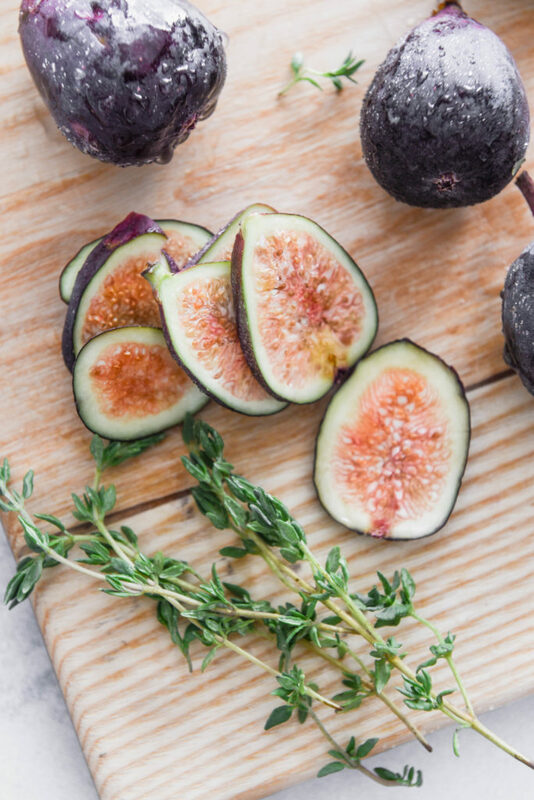 Plump, juicy, and subtly sweet – I love using figs in everything from savory to sweet dishes. Figs are notoriously delicate, though. You’ll want to make sure you store them in a cool dry place and don’t keep them in storage for more than a few days. For this recipe, I used Black Mission Figs but you can use green Turkish figs as well. 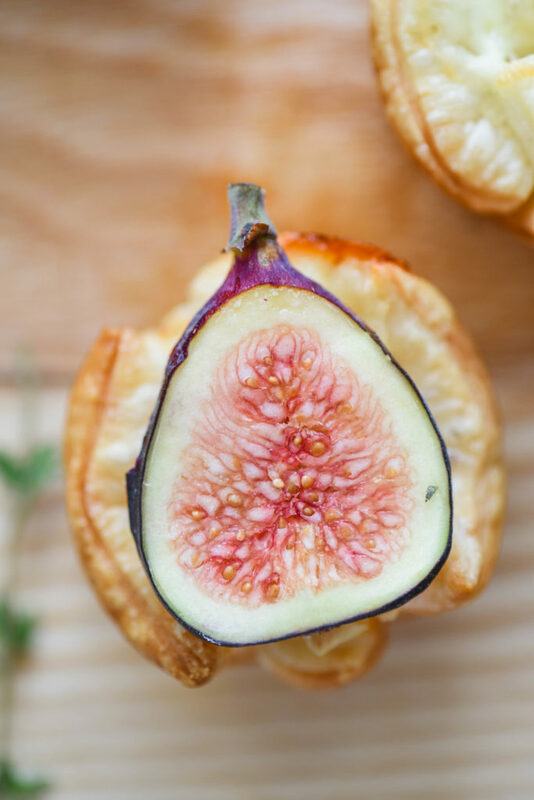 I like to get my figs from Sprouts Farmers Market – they have a heavy focus on quality produce and high standards for the food that they sell. In my local Sprouts, the figs are often located next to the apples and oranges. If you can’t find them in your store, the team in green is always happy to help out! I also love to use their app to create a grocery list so I can save time shopping and make sure I don’t forget anything. Sprouts recently rolled out a delivery feature too which I can’t wait to try out! I’ll be sure to share when I do! 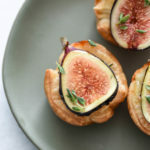 You’ll want to pick up figs, thyme, honey, brie, and puff pastry (usually in the frozen section near the desserts or pizzas) for this appetizer. 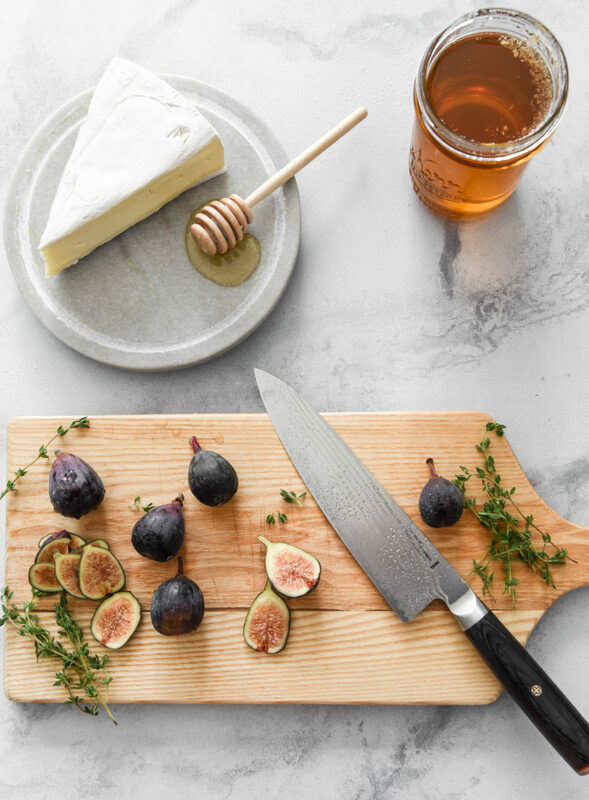 When looking for figs, try to choose ones that are plump, a little firm (no squishy spots!) and avoid ones that are bruised. The darker the color, the more ripe the figs are. So if you’re planning on storing for a few days, try not to pick the darkest figs available. The secret to working with puff pastry is to keep it COLD! I cut my pastry quickly into squares and used a mini muffin tin to shape the tartlets. However, you don’t need to use a muffin tin at all! You can use a small cookie cutter to cut the pastry into circles, and just bake without a mould. And without further ado – here’s the recipe you’ve been waiting for! Serve these bad boys warm and your guests will have no clue how easy they were to make! This quick and flavor packed Thanksgiving appetizer is so easy to make that no one will know it takes less than 15 minutes and 5 steps to make! Cut puff pastry into 24 squares that will fit inside each individual cup of a 24 cup mini muffin tin. My tin allowed for squares that were 6cm x 6 cm. Line each cup of the mini muffin tin with pastry. Drop one cube of brie into each pastry lined cup. Bake for 10-15 minutes or until puff pastry is golden. 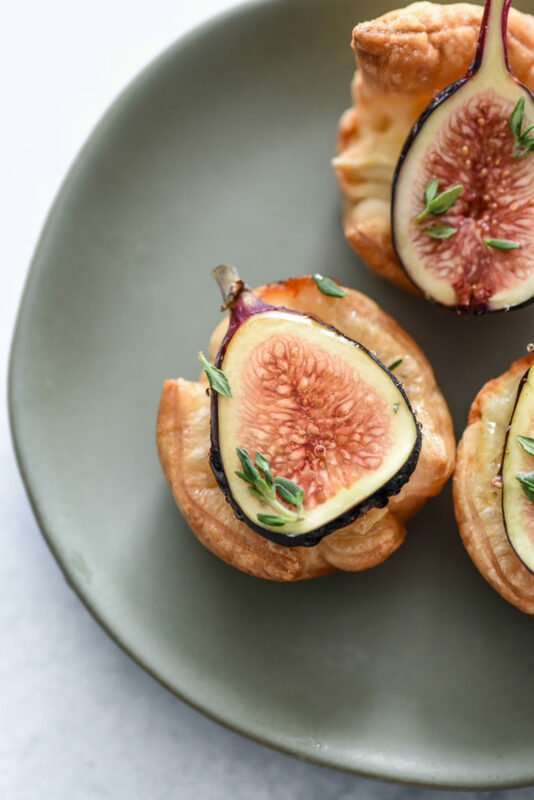 Top each tartlet with a slice of fresh fig, a few leaves of thyme, and a drizzle of honey. A big thanks to Sprouts Farmers Market for sponsoring this post!